As we hear from recent news on countries such as G20 planning exit strategies for their respective stimulus packages costing trillions of US$ which helped their economies navigate out of the woods, this actually raise concerns among investors over the adverse implications that might befall the capital markets again. This shouldn't be a surprise as countries in the past have executed wrong policies which plunged their economies into recession again like what happened in Japan during 1990s and US in 1937-38. There are also some investors who are concerned that the impending exit strategies might include immediate interest rate hikes. My opinion is that the tightening policies will be in a gradual and sequential manner and the governments cannot afford to repeat the mistakes made in the past. To recap, US actually doubled the reserve requirement in 1936-37, raised interest rates, cut fiscal spending and began collecting security taxes all at about the same time, resulting in much of the stimulus disappeared in a hurry. This plunged the economy into recession again in Sept 1937. In a similar situation, Bank of Japan hiked up interest rates in 1989 from 2.5% to 6% within a year, resulting in a recession that never quite pick up right until now. All these measures have an aim: To absorb the massive liquidity injected into the market and to control the excess reserves brought by quantitative easing programme. Despite the liquidity injection by the Fed to normalize the credit market, the banks are not so keen to lend out to the market but tend to put back into the Fed account, resulting in a sudden spike in excess reserves from an insignificant amount in Sept 2008 to US$1trillion in Nov!! If the market recovers again, the gigantic excess reserves could have a money multiplier effect which would cause disastrous consequence. On that note, it is imperative for US government to withdraw these stimulus measures and normalize the financial market again. What about interest rate hikes in US? I think this will still be a distance away for US as the economy remains fragile, unemployment rate remains high, CPI still negative while domestic demand remains weak. Only very few countries can afford interest rate hikes such as Australia and Israel. Australia raised interest rate by 3 times within the last two months to 3.75% from 3%. Until and unless these numbers start improving in US, interest rate hike will not happen. Some estimated that they'll only raise it in 3Q2010 or 4Q2010. From the graph above, unemployment rate and interest rate movement are inversely proportional to each other while interest rate movement is lagging behind CPI and utilization rate. With unemployment rate expected to remain high even for the rest of 2010 coupled with deflationary environment and low domestic demand, interest rate hike might not happen in the near term or until after financial markets could function normally again without the excess liquidity in the market brought by the stimulus measures. Some argue that interest rate hikes will adversely impact the equity market. The reason being it will restrict money supply and liquidity in the market will be limited, thus putting downward pressure on the equity market. 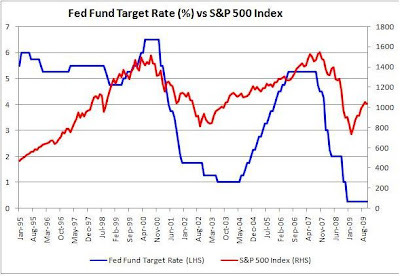 However, the last 2 interest rate hike cycles in US were showing quite the contrary. The interest rate hike seems to be following the trend of the equity index. This might be because interest rate hikes usually occur during the late recovery and expansionary stage where corporate earnings start growing again (the main determinant of equity prices in the long run).